Subscribe today to BirdWatching magazine for tips, hot spots and more! Many news stories about birds and birding have broken over the last few weeks that we haven’t had a chance to cover individually. I’ve summarized 10 of them here. For the latest news and updates, be sure to follow us on Twitter. 1, Cranes in Nebraska. The number of Sandhill Cranes spotted along the Platte River in central Nebraska this spring was off the charts. Andrew Caven, lead biologist for the Crane Trust, wrote on March 24 that aerial surveys found an estimated 598,000 cranes, give or take 111,000. “This represents one of the highest counts recorded in our database (2002-2017) via our survey methods, which always represent a systematic undercount,” he wrote. Chuck Cooper, CEO of the Crane Trust, also noted that more and more people are visiting the Cornhusker State to witness the migration. “We have people from China, Japan, Brazil and Europe. They are coming from all over,” Cooper said. 2, Cormorant collapse. On Thursday, the Audubon Society of Portland (Oregon) and the Center for Biological Diversity released the film Scapegoat: The Cormorants of East Sand Island, by Portland filmmaker Trip Jennings. It documents the slaughter of the world’s largest Double-crested Cormorant colony, found at East Sand Island in the Columbia River. 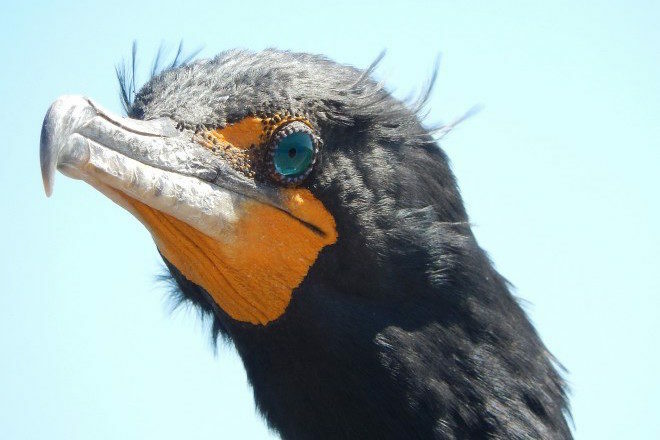 In recent years, federal agents have shot more than 5,000 cormorants and destroyed more than 6,000 active cormorant nests. (Their actions are said to try to protect the river’s salmon population, a notion the film disputes.) With the colony at the brink of collapse, the video calls on the U.S. Army Corps of Engineers and U.S. Fish and Wildlife Service to cease all killing and harassment of the birds. 3, Where Common Terns winter. Using geolocators, a dozen researchers led by Annie Bracey, of the University of Minnesota, tracked Common Terns that breed in Manitoba, Ontario, Minnesota, and Wisconsin. They found that the inland-nesting birds stage on the Gulf of Mexico during migration — a surprise, since it was previously thought that most Common Terns head for the Atlantic coast before continuing south. Most notably, the team learned that most of the terns winter on the coast of Peru, an area that is vulnerable to multiple effects of climate change, including increasingly frequent and severe storms, changes in the availability of terns’ preferred foods, and rising sea levels. “Because survival is lowest during the non-breeding season, identifying coastal Peru as a potentially important wintering location was significant, as it will help us target studies aimed at identifying potential causes of adult mortality in this region,” says Bracey. 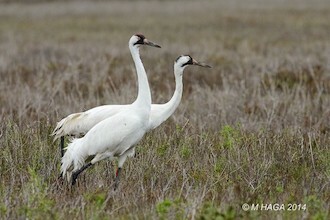 Whooping Cranes at Aransas National Wildlife Refuge, Texas, by mayhaga. 4, Reward in Whooping Crane killings. In mid-March, the Louisiana Department of Wildlife and Fisheries said it’s still looking for information about the shooting deaths of two endangered Whooping Cranes in Acadia Parish on May 20, 2016. Up to $9,000 is being offered by various groups for information that leads to the arrest and conviction of the person or persons responsible. The state agency has released 125 Whoopers since 2011, and currently the population stands at 66 birds. 5, Foe of Endangered Species Act to oversee American wildlife. Last week, Interior Secretary Ryan Zinke reportedly named Susan Combs, a former Texas representative and state comptroller, as acting assistant secretary for fish, wildlife and parks. In that role she will guide policy decisions at both the Fish and Wildlife Service, one of two federal agencies that administer the Endangered Species Act, and the National Park Service. Combs has been a longtime foe of the ESA. In 2015, for example, she led three groups that wanted the Golden-cheeked Warbler delisted. 6, Protections for threatened species up in the air. The Interior Department sent a proposal to the White House on Monday, which has since been leaked to media outlets, that could weaken protections for species listed in the future as threatened under the Endangered Species Act. While it would not apply to currently listed threatened species, it would be “really problematic” for two reasons, says Noah Greenwald, the endangered species director for the Center for Biological Diversity. 7, Higher numbers, but worrisome trends. Last week, in its annual wading bird report, South Florida Water Management District estimated that 46,248 wading bird nests were produced in South Florida in 2017 — a moderate improvement relative to the 10-year annual average (39,065.9 nests). Wood Storks doubled their 10-year nesting average while Little Blue Heron and Snowy Egrets were up 62 and 54 percent, respectively. Record rainfall last spring is credited with the increases, but as the Miami Herald reports, the birds “appear to be giving up on the southern Everglades” for breeding areas farther north. 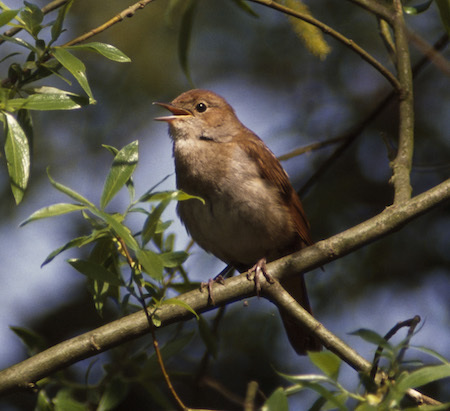 8, Nightingale habitat threatened. In the U.K., a proposed development of thousands of homes in Lodge Hill, an area of ancient woodlands and rare grasslands in Kent, southeast of London, is threatening one of the last strongholds in England of the Common Nightingale. In the U.K., its population has dropped about 90 percent in the last 50 years, to just a few thousand pairs. 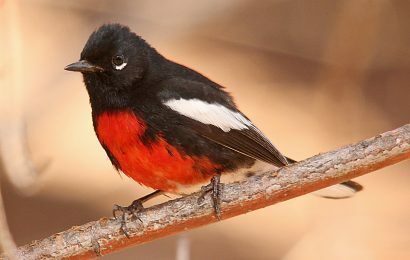 The Royal Society for the Protection of Birds and the Kent Wildlife Trust are leading efforts to oppose the development. 9, Fighting for the MBTA. This week, 10 U.S. senators (nine Democrats and independent Bernie Sanders) sent a letter to Zinke calling on him to continue enforcing the Migratory Bird Treaty Act. “We ask that you continue to enforce this foundational bird conservation law as every administration from across the political spectrum has done for more than forty years,” the senators wrote. In late December, an Interior Department official released an opinion saying the MBTA no longer protects against incidental bird deaths, effectively giving a blank check to industry to avoid mitigating bird deaths. 10, Real-time migration forecasts. 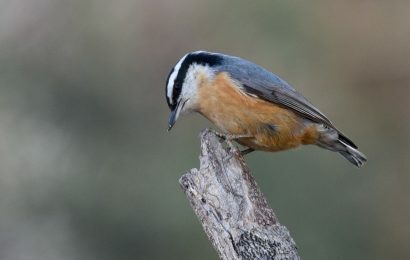 Finally, the coolest bit of news we’ve seen in a while is that scientists with the Cornell Lab of Ornithology and the University of Oxford have worked out how to follow large-scale bird migrations in near real-time and how to predict pulses of migrants three days ahead, using weather radar. 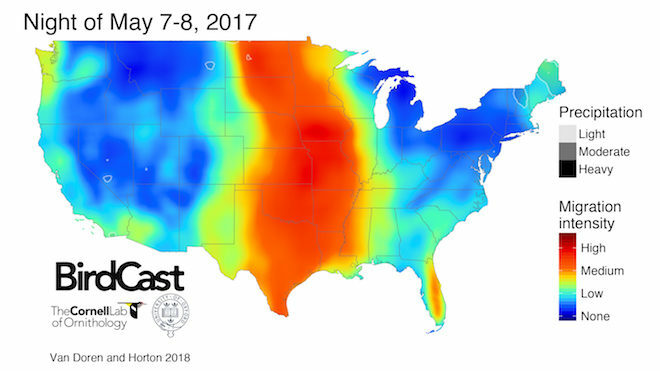 The radar data are processed into two types of visualizations to show where, when, and in what intensity the birds are migrating, or are expected to be migrating in the nights ahead. 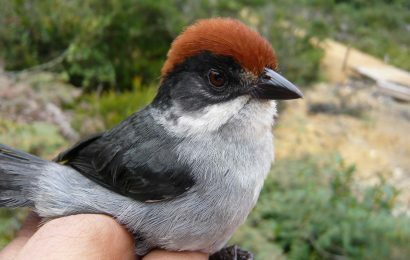 The forecasts are hosted on the Lab’s BirdCast website. Here’s an explanation of how to use the site. This innovation should help us all see more birds this spring! What’s not to love?